WASHINGTON (January 9, 2006) -- High-speed whorls of gas are spiraling into a supermassive black hole at the center of a large galaxy like water spiraling down a bathtub drain, according to an international team of astronomers headed by Kambiz Fathi of the Rochester Institute of Technology. The astronomers measured the spiral pattern down to about 10 light-years from the black hole itself, providing the closest look yet at material flowing into a black hole at the heart of a large galaxy. Fathi reported his team's findings at the American Astronomical Society conference. The galaxy is known as NGC 1097. It's about 47 million light-years away, in the southern constellation Fornax. It is classified as a "barred spiral" galaxy because a long, straight bar of stars stretches across its center, with spiral arms streaming off the end of the bar. It is about 250,000 light-years in diameter -- roughly twice the size of the Milky Way. Fathi and other astronomers used the Gemini South Telescope in Chile to see clouds of material close to the black hole, which is as massive as 100 million Suns. 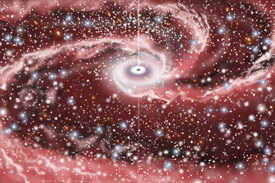 They used computers to subtract the general rotation of the galaxy, allowing them to trace the path of the gas that is spiraling into black hole. They also measured the speed of the gas within about 30 light-years of the black hole, and found that the gas is crashing inward at more than 100,000 miles per hour (50 kilometers per second). At that rate, if it doesn't ram into other gas clouds or get pushed about by the gravity or "winds" of other stars, the gas would need about 200,000 years to cross the final 30 light-years to the black hole. The black hole is "eating" the equivalent of several Suns-worth of gas every year, Fathi reported. This is the first time that astronomers have seen the overall feeding process so close to a black hole in another galaxy.